SPECIAL ...Take $150.00 off each week left on my calendar. Our fully renovated cottage, directly across the street from Nantucket Sound, is the perfect setting for your Vineyard vacation. We are within walking distance to all amenities: beach, shopping (food and gifts), restaurants, movies, bike and moped rentals, galleries and summer band concerts and the bike path. 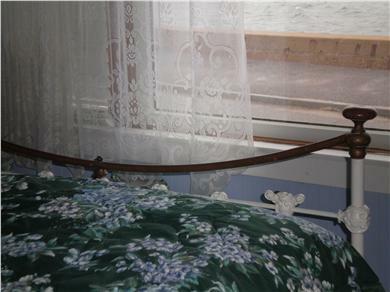 The cottage has three bedrooms: 1 double and 1 queen and 1 with twin beds. The front bedrooms face the water. One has a balcony and the other is a tower room with huge picture window. There are 2 bathrooms, upstairs with a tub/shower combo downstairs with shower. The kitchen is up to date with all stainless appliances as well as almost anything else you would need to make your culinary experience complete. The dining room is large and airy with a slider to our very large deck. 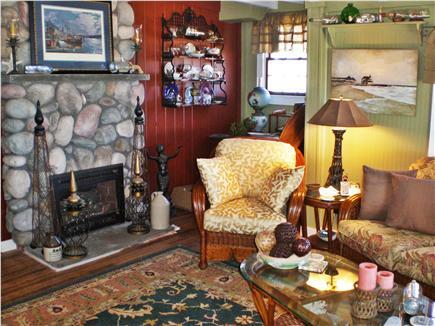 The living room has been newly redecorated and has a lovely beach stone fireplace. There is a laundry room with washer/dryer, and an open front porch to watch the world go by. There also is ductless air conditioning for the entire house. The back yard sports lovely gardens, a gas barbeque grill and an outside shower. Due to the proximity to town, for a short stay (1 week), a car is not necessary. If visiting other towns and areas of the island is in your plans, the public bus can be hailed right in front of the house, and it will take you wherever you want to go. Bus passes may be purchased for your length of stay. 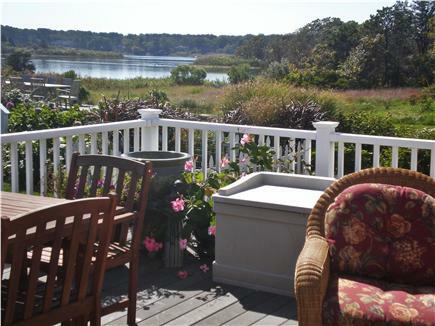 Our favorite spot is our tranquil deck with views of both Farm Pond to the rear and Nantucket Sound to the front. Potted plants, all weather wicker furniture and an umbrella table to enjoy al fresco dining complete the picture. For the bicycle enthusiast, the paved island bike path is two houses away. This offers a safe way to explore the Vineyard from a different perspective. Finally, you may have noticed a couple of furry felines in the photos. The kits have not been in the house in over three years .Many cleanings have taken place over the ensuing years. You must determine whether this fact affects your vacation plans. Thank you for taking the time to explore our Vineyard cottage. We are very happy to answer any questions or try to resolve any issues. Just call or email. Additional pricing info: Will discount for two or more weeks, State and local taxes of 11.7% will apply. My friends and I had a wonderful week in this terrific Quahog Cottage! The house itself is amazing - something interesting to see in every nook and cranny. The kitchen and dining area are VERY fully stocked with spices, dishware, glassware and cooking implements - we wanted for nothing! Location is excellent - the inside and outside living areas are comfortable and the views can't be beat. The new a.c. units work perfectly, if you need them. Pat is patient, helpful and quick to respond to any questions. Quahog Cottage with Double View Vistas! We were so lucky to have secured this cottage for our annual vacation. Having 25+ years of summers in OB this was by far the most scenic with views of both the bay and the lagoon. The cottage provides ample alfresco dining and relaxing space both on the front porch and back deck. 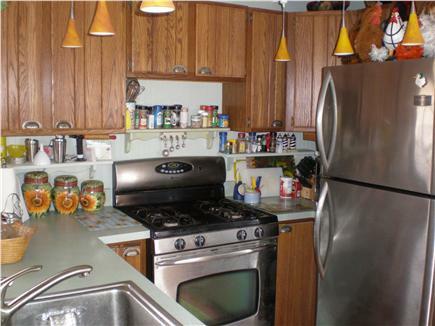 Inside the house functions great with large dining and living spaces and two updated baths. 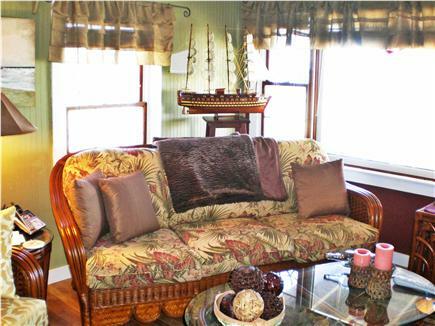 The front bedrooms offer a cruise ship view, and the master bedroom is HUGE with a separate sitting area. The cottage is also so convenient! You can walk or bike to just about everywhere. We look forward to returning to Quahog Cottage in the future. This is a lovely cottage. 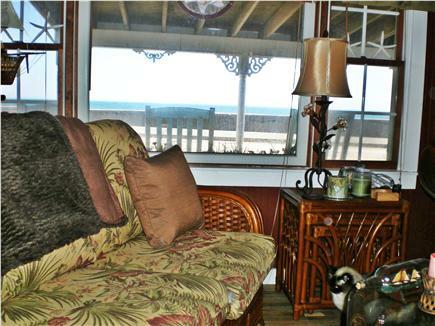 The location is fantastic, the view from both the front and back of the house is gorgeous and it's air conditioned! My family has stayed there several years in a row and no other property that we've searched compares for the price. The owners are wonderful and responsive as well. Thank you, Jacqui, for your kind words. I am very glad you have enjoyed your vacations in my Vineyard cottage and I will look forward to your return. Best wishes to you and your family. Have a wonderful new year. Quahog cottage had all the comforts of home. We enjoyed having our morning coffee watching the sunrise over the ocean. The upper deck was fun in the afternoon watching all the boat activity. The main deck was great for cooking out and again having a great view of the ocean. The cottage is located close to the bike path and downtown. We had an awesome week. Thank you so much for your kind words. I am so happy that my Vineyard cottage helped make your vacation a success. Please keep me in mind if your plans include another trip to MV. All the best to you and your family. We've been going to the Vineyard every year for almost 30 years and this home is by far the best we've experienced. 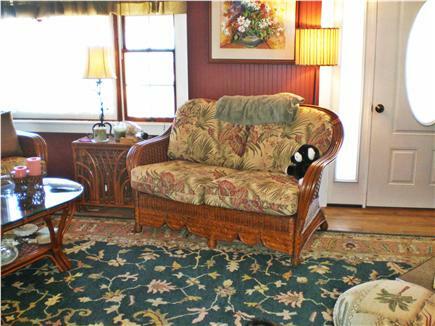 It is a charming old home with lots of character, gorgeous views and all the amenities needed. No car is needed since it is walking distance to town and beaches and right along the bike path. A perfect location and a perfect home! We stayed for 1 week at this cottage and had a wonderful time. It was the first time we had ever spent more than 1/2 day at Marthas Vineyard. We didn't bring a car (just 4 bikes plus luggage) and it worked out great. 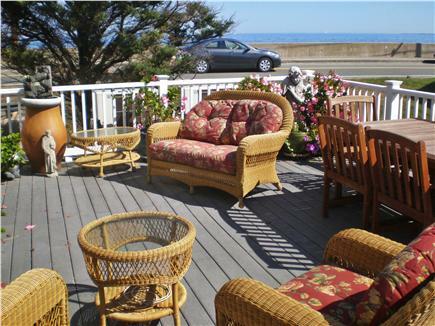 The cottage is about a 10 minute walk from Oak Bluffs and is directly across from the ocean. There is plenty of parking though if you do bring a car. A swimmable beach is a 3 minute walk up the road or you can take the Edgartown bus 3 miles to another beach, or take the bus all the way to Edgartown and then take another short bus ride to the beautiful South Beach. We liked the beach right near the cottage the best as the water was very calm and it was so convenient. Not having a car, getting off the ferry & being able to walk to the cottage was a huge benefit for us. It's also an awesome walk along the ocean. We did it many times while we were there. Oak Bluffs has plenty of good restaurants as well. The cottage itself was great. We had 4 people, 2 adults and 2 kids. There is Air Conditioning in each of the bedrooms and the main living area, which was awesome. We mainly used the AC in the bedrooms at night. We weren't in the main living area much, but when we were it was cool enough that we didn't need the AC, an oy yeah the AC units all have remote control. The house was very comfortable, though going up the stairs you have to be careful as the ceiling is low in 1 spot & it's easy to hit your head if your not paying attention. The kitchen is amply supplied so if you like to cook you'll be very happy. We mostly ate cereal in the A.M and either cooked out or ate out at night. The deck is awesome, very comfortable chairs, etc.... There's a gas grille as well which we used that worked great. We mainly used the outdoor shower, but did use the indoor shower a few times. Both worked fine. The view from the cottage to the ocean is spectacular, as were the sunsets. A few times late at night I'd just walk out the front door over to the beach & just sit & people watch or just relax on the front porch with a book. The house was well stocked with linens, books to read, etc... There's a flat screen cable t.v. in the main living area. There is also separate dining area as well. All in all, we had a wonderful stay on Marthas Vineyard. So easy to get around the island due the Marthas Vineyard transit. We went & saw the M.V. Sharks baseball team play (by bus) & biked to Edgartown 3 or 4 times, and yes, the bike path is right outside the cottage. For our family, worked out great, a very comfortable cottage, easily acccessible from Oak Bluffs (where the Ferry comes into). One suggestion is if you don't have a car & traverse the island a few times, you'd be better off getting a transit pass for the week, which is more convenient & cheaper as well. Finally, I had a bunch of questions as I wasn't very familiar with Marthas Vineyard & the owners Ralph & Pat) could not have been more helpful. They responded very quickly & all the suggestions they gave us were great. 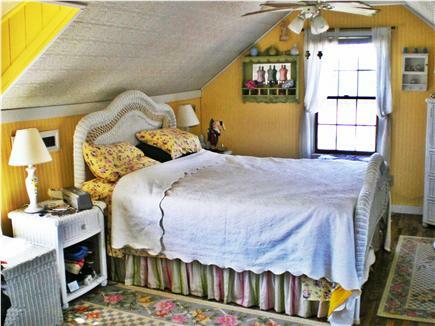 If you want a comfortable stay on Marthas Vineyard, this cottage is a great choice. I have been a Vineyard vacationer since the mid 1950's. My family looked forward to our 3 weeks spent at a very camp like cottage in Oak Bluffs. When I married, I introduced my new husband to the island, he too fell in love with everything about it, saying some day we are going to buy a cottage here. Well, our dream came true in 1977 when we purchased what we now call Quahog Cottage. I was lucky enough to spend entire summers here and our daughter got her first job in Oak Bluffs. A lot has changed over the years: the island is busier, our cottage has morphed into a very cozy home with lots of amenities. What has remained the same is our special love for MV, the amazing views and the unforgettable sea noises that surround us. We are happy to share this all with our guests for a few weeks each summer. Come and see what I am talking about. 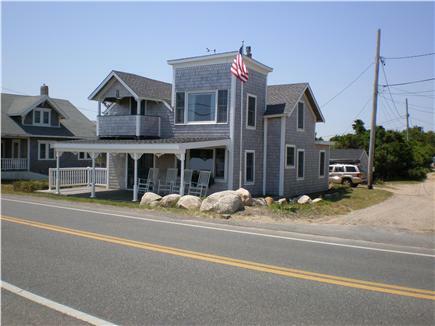 The location of Quahog Cottage is one of its greatest assets. 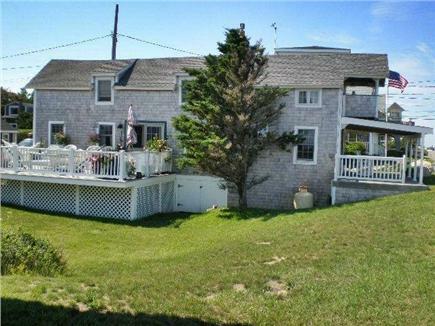 We are directly across from Nantucket Sound with views from nearly every vantage point. The front porch with rocking chairs puts you up front for people watching. Our very large side deck has wonderful views of Farm Pond as well as the sound. 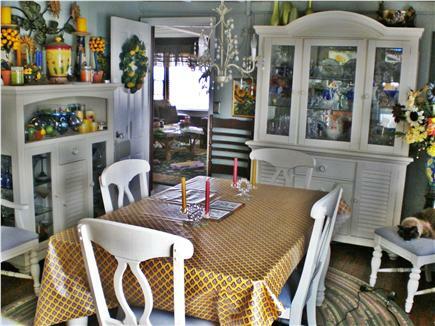 It is outfitted with very comfortable wicker like furniture and a large table and chairs for meals or snacks. Steps away is a gas grill and our large outdoor shower...so much fun and so convenient after a day at the beach. We recently added LG Minisplits to cool in the summer and warm in the Fall. The kitchen is very well stocked with pots, pans, utensils and a variety of spices since for most of the season it is my ''home'' kitchen. 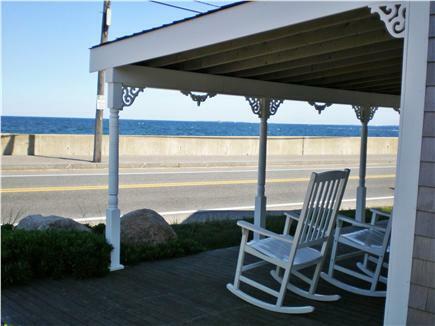 The cottage is an easy walk to the town of Oak Bluffs. The town provides shopping, dining and entertainment resources. The oldest carousel in the nation is here for your chance to grab a brass ring. We have a brand new bowling alley/and restaurant for great family fun. Circuit Ave is home to shopping of all sorts, grocery as well as gifts, wonderful family fare dining like Biscuits for breakfast, Linda Jeans for lunch, Giordano's for great Italian and fine dining at Sweet Life Cafe. The beach is literally in your front yard...with famous Inkwell Beach some yards down the sea wall walk. Public transportation can be flagged down in front of the cottage to take you toward Vineyard Haven or Edgartown. Rentals of all kinds are available, mopeds, bikes, boats, jet skies, wind and kite surfing gear, charter fishing boats and lots more. We are just beyond the bustle of town...but an easy walk into town. This is a great feature especially on busy August nights when finding a parking place in town may be close to impossible. Watch the fireworks from your front porch.